KENNEDY SPACE CENTER, FL – Concluding a month long stay at the International Space Station (ISS) a SpaceX Dragon cargo freighter loaded with some two tons of NASA research samples, hardware and micestonauts returned home to make a successful splashdown in the Pacific on Sunday, Sept. 17. The SpaceX Dragon CRS-12 resupply ship successfully splashed down in the Pacific Ocean at approximately 10:14 a.m. EDT, 7:14 a.m. PDT, 1414 GMT Sunday, southwest of Long Beach, California, under a trio of main parachutes. The parachute assisted splashdown marked the end of the company’s twelfth contracted cargo resupply mission to the orbiting outpost for NASA. The capsule returned with more than 3,800 pounds (1,700 kg) of cargo and research and 20 live mice. “Good splashdown of Dragon confirmed, completing its 12th mission to and from the @Space_Station,” SpaceX confirmed via twitter. Liftoff of the SpaceX Falcon 9 carrying Dragon CRS-12 to orbit took place from seaside pad 39A at NASA’s Kennedy Space Center in Florida on Aug. 14 at 12:31 p.m. EDT (1631 GMT). After a two day orbital chase Dragon had been berthed at the station since arriving on Aug. 16. Dragon’s departure began early Sunday morning when Expedition 53 Flight Engineer Paolo Nespoli of ESA (European Space Agency) and ISS Commander Randy Bresnik of NASA released the Dragon spacecraft from the grips of the Canadarm2 robotic arm at 4:40 a.m. EDT, 1:40 a.m. PDT, 840 GMT. The departure events were carried live on NASA TV. There was no live broadcast of the Pacific Ocean landing. Working from a robotics work station inside the seven windowed domed Cupola module Nespoli and Bresnik used the station’s 57.7-foot-long (17.6 meter-long) Canadian-built robotic arm to detach Dragon from the Earth-facing port of the Harmony module and release it into space. “We would like to give a big thanks to all the operational teams around the world that keep our presence in space possible – to the scientists and engineers that provide the outstanding research and equipment that we have in space, to NASA and all the space agencies that contribute to the space station. And to SpaceX for giving us this outstanding vehicle,” Nespoli radioed. Dragon then backed away slowly via a trio of thruster firings. “The three departure burns to move Dragon away from the @Space_Station are complete,” SpaceX confirmed. The final de-orbit burn took place as planned around 9 a.m. EDT some four and a half hours after leaving the station and setting Dragon up for the scorching reentry into the Earth’s atmosphere. “Dragon’s de-orbit burn is complete and trunk has been jettisoned. Pacific Ocean splashdown in ~30 minutes,” said SpaceX. All the drogue and main parachutes deployed as planned during the descent to Earth. SpaceX commercial naval ships were on standby to retrieve the spacecraft from the ocean and sail it back to port in Long Beach, California. Some time critical research specimens will be removed immediately for return to NASA. The remainder will be transported back with Dragon to SpaceX’s test facility in McGregor, Texas, for final post flight processing and handover to NASA. “A variety of technological and biological studies are returning in Dragon. NASA and the Center for the Advancement of Science in Space (CASIS), the non-profit organization that manages research aboard the U.S. national laboratory portion of the space station, will receive time-sensitive samples and begin working with researchers to process and distribute them within 48 hours,” said NASA in a statement. SpaceX holds a NASA commercial resupply services (CRS) contract that includes up to 20 missions under the original CRS-1 contract. The 20-foot high, 12-foot-diameter Dragon CRS-12 vessel carried more than 6,400 pounds ( 2,900 kg) of science experiments and research instruments, crew supplies, food water, clothing, hardware, gear and spare parts to the million pound orbiting laboratory complex when it launched Aug. 14 from KSC pad 39A. 20 mice were also onboard and were returned alive on the round trip flight. This mission supported dozens of the 250 research investigations and experiments being conducted by Expedition 52 and 53 crew members – including NASA’s space endurance record breaking astronaut Peggy Whitson. Whitson returned to Earth in a Soyuz capsule earlier this month following a 10 month mission and carried out research included in the samples returned by Dragon CRS-12. The next SpaceX Dragon is due to blastoff around December from KSC. An Orbital ATK Cygnus cargo ship is slated to launch in November from NASA Wallops in Virginia. Watch for Ken’s continuing onsite NASA mission reports direct from the Kennedy Space Center and Cape Canaveral Air Force Station, Florida. NASA’s Peggy Whitson, America’s most experienced astronaut, returned to Earth safely and smiling Sunday morning on the steppes of Kazakhstan, concluding her record-breaking stay in space aboard the International Space Station (ISS) along with Soyuz crewmates Jack Fischer of NASA and Commander Fyodor Yurchikhin of Roscosmos. The multinational trio touched down softly on Earth inside their Soyuz MS-04 descent capsule on Saturday evening, Sept. 2 at 9:21 p.m. EDT (shortly after sunrise 7:21 a.m. Kazakhstan time, Sept. 3), some 90 miles southeast of the remote town of Dzhezkazgan in Kazakhstan. Whitson wrapped up a 288-day extended mission in obviously good health that began in November 2016, spanning 122.2 million miles and 4,623 orbits of Earth – completing her third long-duration stay on the orbiting science outpost spanning Expeditions 50, 51 and 52. “A flawless descent and landing,” said NASA commentator Rob Navias during the live NASA TV coverage of the return of the ISS Expedition 52 crew Saturday afternoon and evening US time. She has now accrued a total of 665 days in space – more than any American astronaut – over the course of her illustrious career during which she set multiple U.S. space records spanning a total of three spaceflights. Whitson’s 665 total accumulated days in space places her eighth on the all-time space endurance list – just 8 days behind her Russian crewmate and Soyuz Commander Fyodor Yurchikhin who now ranks 7th on the all-time list with 673 days in space on his five flights. She has exceeded the endurance record of her next closest NASA competitor by 131 days – namely NASA astronaut Jeff Williams. The remarkable 57-year-old Ph.D biochemist by training has spent nearly 2 years of her entire life in space and she holds several other prestigious records as well – including more accumulated time in space than any other woman and the longest single spaceflight by a women – 288 days! During this mission Whitson became the first woman to serve twice as space station commander. Indeed in 2008 Whitson became the first woman ever to command the space station during her prior stay on Expedition 16 a decade ago. Her second stint as station commander this mission began earlier this year on April 9. Whitson also holds the record for the most spacewalks and the most time spent spacewalking by a female astronaut. Altogether she has accumulated 60 hours and 21 minutes of EVA time over ten spacewalks -ranking her third most experienced in the world. Notably Soyuz Commander Yurchikhin ranks fourth in spacewalking experience. Only Russia’s Anatoly Solovyev and NASA’s Michael Lopez-Alegria have more spacewalking time to their credit. NASA’s Jack Fischer completed his rookie spaceflight accumulating 136 days in space aboard the ISS. Whitson originally launched to the ISS on Nov 17, 2016 aboard the Russian Soyuz MS-03 spacecraft from the Baikonur Cosmodrome in Kazakhstan, as part of the three person Expedition 50 crew including flight engineers Oleg Novitskiy of Roscosmos and Thomas Pesquet of ESA (European Space Agency). Her flight was unexpectedly extended in flight after the Russian government decided to cut back on the number of space station crew cosmonauts this year from three to two to save money. Thus a return seat became available on this Soyuz MS-04 return flight after NASA negotiated an extension with Rosmoscos in April enabling Whitson to remain on board the orbiting outpost an additional three months beyond her than planned June return home. Whitson’s mission extension proved to be a boon for NASA and science research enabling the US/partner USOS crew complement to be enlarged from three to four full time astronauts much earlier than expected. This allowed NASA to about double the weekly time devoted to research aboard station – a feat not expected to happen until America’s commercial crew vehicles, namely Boeing Starliner and SpaceX Crew Dragon – finally begin inaugural launches next year from the Kennedy Space Center in mid-2018. Descending dramatically while hanging below a single gigantic orange-and-white parachute the scorched Russian Soyuz vehicle fired its braking rockets just moments before touchdown in Kazakhstan to cushion the crew for a gentle landing under beautifully sunny skies. A live NASA TV video feed captured the thrilling descent for over 14 minutes after the main parachute deployed all the way to the ground under clear blue sunny Sunday morning weather conditions and comfortably local Kazakh temperatures of 77 degrees F.
Russian search and recovery forces quickly arrived via a cluster of MI-8 helicopters after the soft landing to begin their normal procedures to extract the three Expedition 52 crew members from their cramped Soyuz descent module. Soyuz Commander Yurchikhin in the center seat was hauled out first, followed by Fischer in the left side seat and lastly Whitson in the right seat. All 3 were placed on reclining seats sitting side by side and appeared quite well, conversing and speaking via satellite phones. A group of Russian and US medical teams were on hand to check the astronauts and cosmonauts health and help the crewmates begin readapting to the tug of Earth’s gravity they have not experienced after many months of weightlessness in space. Whitson’s final planned news conference from space with the media to sum up her experiences this past Wednesday had to be cancelled due to the catastrophic flooding events from Hurricane Harvey impacting Houston and elsewhere in Texas – including Mission Control which was forced to close multiple days. The crews had bid their final farewells earlier and closed the hatches between the Soyuz and station at 2:40 p.m. EDT Saturday. After conducting final spacecraft systems checks the trio unhooked the latches and undocked from the International Space Station at 5:58 p.m. EDT to begin their voyage home through the scorching heats of reentry in the Earth’s atmosphere that reached over 2500 degrees F (1400 degrees C) on the outside. “While living and working aboard the world’s only orbiting laboratory, Whitson and Fischer contributed to hundreds of experiments in biology, biotechnology, physical science and Earth science, welcomed several cargo spacecraft delivering tons of supplies and research experiments, and conducted a combined six spacewalks to perform maintenance and upgrades to the station,” said NASA. ISS Expedition 53 began at the moment of undocking from the space station, now under the command of veteran NASA astronaut Randy Bresnik since the official change of command ceremony on Friday. Along with his crewmates Sergey Ryazanskiy of Roscosmos and Paolo Nespoli of ESA (European Space Agency), the three-person crew will operate the station for the next 10 days until the imminent arrival of three new crew members. The station will get back to a full complement of six crewmembers after the upcoming Sept. 12 launch and fast track 4 orbit 6 hour docking of NASA astronauts Mark Vande Hei and Joe Acaba of NASA and Alexander Misurkin of Roscosmos aboard the next Soyuz MS-06 spacecraft departing from the Baikonur Cosmodrome, Kazakhstan. Meanwhile the next launch from the Kennedy Space Center is slated for this Thursday, Sept.7 is the SpaceX Falcon 9 carrying the USAF X-37B OTV-5 military mini-shuttle to low Earth orbit -detailed here. An all veteran multinational trio of astronauts and cosmonauts rocketed to orbit aboard a Russian Soyuz capsule and safely arrived at the International Space Station (ISS) after a fast track rendezvous on Friday, July 28. NASA astronaut Randy Bresnik, Sergey Ryazanskiy of Roscosmos and Paolo Nespoli of ESA (European Space Agency) docked at the orbiting outpost at 5:54 p.m. EDT (2154 GMT) Friday just six hours after departing our Home Planet. The three crewmates launched aboard the Russian Soyuz MS-05 spacecraft from the Baikonur Cosmodrome in Kazakhstan during a typically hot mid-summers night at 9:41 p.m. Baikonur time, or 11:41 a.m. EDT, 1541 GMT, as the booster and Baikonur moved into the plane of the space station’s orbit. They blasted to space from the same pad as Yuri Gagarin, the first man in space. The entire launch sequence aboard the Soyuz rocket performed flawlessly and delivered the Soyuz capsule to its targeted preliminary orbit flowing by the planned opening of the vehicles solar arrays and antennas. Following a rapid series of orbit raising maneuvers, the Soyuz reached the ISS after 4 orbits and six hours to successfully complete all the rendezvous and docking procedures. The Soyuz docked at the Earth-facing Russian Rassvet module as the spaceships were flying some 250 mi (400 km) over Germany. Following the standard pressurization and leak checks, the hatches between the spacecraft and station were opened from inside the ISS at about 9:45 p.m. EDT. The new trio of Bresnik, Ryazanskiy and Nespoli then floated one by one from the Soyuz into the station and restored the outpost to a full strength crew of six humans. The veteran space flyers join Commander Fyodor Yurchikhin of Roscosmos and Flight Engineers Peggy Whitson and Jack Fischer of NASA who are already serving aboard. Thus begins Expedition 52 aboard the million pound orbiting science complex. This is the second space flight for both Bresnik and Ryazanskiy and the third for Nespoli. Bresnik previously flew to the space station as a member of the STS-129 space shuttle Atlantis mission in November 2009. The 10 day mission delivered two Express Logistics Carriers (ELC racks) to the space station as part of approximately 30,000 pounds of replacement parts. Bresnik performed two spacewalks for a total of 11 hours and 50 minutes during the STS-129 mission. He is slated to take command of the ISS as a member of Expedition 53. The new Expedition 52 crew will spend a four and a half month stint aboard the station and continue over 250 ongoing science investigations in fields such as biology, Earth science, human research, physical sciences and technology development. Bresnik, Ryazanskiy and Nespoli are slated to stay aboard until returning to Earth in December. Whitson, Fischer and Yurchikhin are in the home stretch of their mission and will retun to Earth in September. Shortly after their departure, NASA astronauts Mark Vande Hei and Joseph Acaba and Russian cosmonaut Alexander Misurkin will launch on the next Soyuz from Kazakhstan to join the Expedition 53 crew. Whitson is the most experienced US astronaut with time in space. Her record setting cumulative time in space will exceed 600 days and include a 9 month stay on this flight upon her return to Earth. She most recently launched to the ISS last year on Nov 17, 2016 aboard a Russian Soyuz capsule from the Baikonur Cosmodrome. This is her 3rd long duration stay aboard the station. The newly-expanded Expedition 52 crew expect to welcome a pair of unmanned US cargo ships carrying new research experiments and supplies, namely the SpaceX Dragon as soon as August and Orbital ATK Cygnus a month or two later, on NASA-contracted commercial resupply missions. NASA has at last today (June 7) released the spectacular portrait photos of Endeavour docked at the International Space Station (ISS). These are are the first ever images taken of a space shuttle while still attached to the orbiting lab complex from the perspective of a crewed Russian Soyuz spacecraft. The ISS/Shuttle stack and Soyuz were flying at an altitude of 220 miles as the Soyuz undocked with Nespoli, Russian cosmonaut Dmitry Kondratyev and NASA astronaut Cady Coleman. After they were about 600 feet away, Mission Control Moscow commanded the ISS to rotate 130 degrees to give a full view of the entire complex from the side. Nespoli then had about 30 minutes to capture high resolution digital photos and videos of Space Shuttle Endeavour docked to the orbiting lab for the very last time in the midst of her 16 day long final mission; STS-134. The Soyuz trio landed safely in Kazakhstan later that day. The imagery was to have been made public a day or two after the landing. But Nespoli accidentally left the SD data cards behind in the Soyuz vehicle, causing them to processed more slowly as part of routine post flight analysis. KENNEDY SPACE CENTER – Unprecedented and spectacular photos showing a US Space Shuttle Orbiter docked to the International Space Station (ISS) were snapped just hours ago and transmitted live back to ground stations and viewers on Earth as a Soyuz capsule with three space flyers departed from the station at 5:35 p.m EDT on the first leg of their journey back to Earth. And the best is yet to come. Check out the photo galley of historic black and white gems captured from an engineering docking camera attached to the nose of the Russian Soyuz capsule that undocked this evening (May 23) from the ISS. These historic photos are the first ever showing a shuttle joined to the massive orbiting complex. As the Soyuz was backing away from the Russian-built Rassvet module, Italian Astronaut Paolo Nespoli was busily snapping first of its kind high resolution color photos and videos of Space Shuttle Endeavour attached to the ISS. Nespoli had about 30 minutes to collect high resolution digital imagery from a viewing port inside the habitation module of the Soyuz spacecraft that burns up on reentry. He then removed the cards from the cameras and floated back into the Soyuz descent module. NASA and Russia expect to release high resolution digital imagery on Tuesday or Wednesday. The three person Expedition 27 crew comprising of Commander Dmitry Kondratyev and Flight Engineers Cady Coleman and Paolo Nespoli landed safely in their Soyuz spacecraft on the Kazakhstan steppe Monday at 10:27 p.m. (8:27 a.m. on May 24 local time) at a site southeast of the town of Dzhezkazgan. Shuttle Endeavour is in the middle of the 16 day STS-134 mission and delivered the $2 Billion Alpha Magnetic Spectrometer to the ISS. The AMS is a particle physics detector searching for the invisible Universe and seeks to elucidate its birth and evolution. 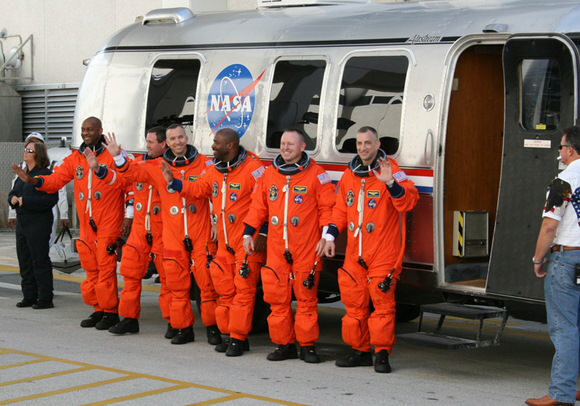 The all veteran crew of 6 is led by Shuttle Commander Mark Kelly. KENNEDY SPACE CENTER: Get ready for the ultimate photo op in space – set for the International Space Station joined to Space Shuttle Endeavour and topped off by Planet Earth as the backdrop. And it’s coming up momentarily because of an unexpected and “unique opportunity” that’s also taking place at nearly the last possible moment in the life of the soon to be retired Space Shuttle program. On Monday, May 23, Italian Astronaut Paolo Nespoli will snap the first ever photos and video of a US Space Shuttle orbiter while it is simultaneously still docked to the International Space Station, NASA officials just announced on Friday, May 19. Nespoli will capture the dramatic and historic imagery – in a newly devised plan – while he is departing the “Shuttle- Station stack” aboard a Russian Soyuz spacecraft and heading for a landing back on Earth with two crewmates barely 4 hours later in Kazakhstan. After months of high level international negotiations since the STS-133 mission, NASA and Russian space officials from the space shuttle and space station teams have finally agreed on a arrangement for utilizing a crewed Soyuz vehicle to record the first ever photos showing a shuttle while still docked to the massive orbiting outpost in the same field of view. The chance to do the shuttle- station photo documentation in this way only became possible when the launch of Space Shuttle Endeavour was scrubbed on April 29 and the resulting delayed launch of the STS-134 mission on May 16 fortuitously afforded an overlapping time period that coincided with the Soyuz TMA-20 crew departure. Space Shuttle Endeavour launches from Pad 39 A on May 16, 2011 on the STS-134 mission. The photo opportunity will take place under what’s called a dual docked operations scenario whereby the Soyuz is undocked while a shuttle is still attached to the ISS. “With 100 percent consensus, we approved this change to the baseline mission to go add this photo documentation task as part of the Soyuz TMA-20 undock,” Todd explained. In order to accommodate the extra time required to accomplish the photo shoot, the Soyuz TMA-20 capsule will undock from the ISS one orbit earlier than originally scheduled, about 90 minutes, at 5:32 p.m. EDT. “After they get to the station keeping point, ISS will begin to maneuver, turning 130 degrees at 0.2 degrees per second.” The attitude was designed to provide the best perspective of the ISS and Endeavour. The station move will be done using thrusters on the Russian Segment service module – named Zvezda – and the thrusters on the docked Progress 42P vehicle, an unmanned Russian cargo ship. See diagram below. Nespoli will have to float into the Soyuz vehicles forward habitation module – from his seat in the central descent module – and then snap the photo and video imagery through the modules windows. He will have a direct line of sight to the stack. Paolo will have roughly 30 minutes time to collect all the imagery of the combined space complex during the photo survey, starting at about 5:50 p.m. EDT. Then he will float back out of the habitation module, carefully seal the hatches in between and take his seat in the descent module. The habitation module burns up in Earth orbit after the modules separate in preparation for the Soyuz’s deorbit and scorching reentry into Earth’s atmosphere. The goal is to get good archival imagery of the space station stack with the shuttle attached. In addition to the gee whiz factor there are good reasons from an engineering perspective to record this imagery to assess the condition of the orbiting complex, NASA managers said. “These pictures will be in textbooks to show what we did”, said Todd. Exactly when the digital photos and video will be available for all to see is still to be determined. NASA and Russian space officials are discussing the details of when and how to distribute the imagery. The Soyuz is not equipped to transmit the imagery in real time. “We hope to start seeing the photos and videos within a day of landing”, said Todd. Paolo has snapped many gorgeous shots during his stay in space, including these of an Ariane V launching the European ATV cargo craft from French Guiana.